This article first was published by WDDE.org, the online arm of Delaware’s NPR News Station, on March 22, 2013. Not so long ago, the hours between the ringing of the last school bell and the flickering of the first streetlight were filled with peals of laughter and children’s shouts. Kids careened around the block with playing cards humming in the spokes of bicycle tires, claimed driveways for pickup games of basketball, and otherwise ran themselves ragged. Today, many suburban neighborhoods remain quiet from 3 to 6 pm, as more kids have retreated indoors. Whether lured inside by the Internet and video games, or told to stay inside while parents are at work, many kids today are no longer getting much exercise during these late afternoon hours. 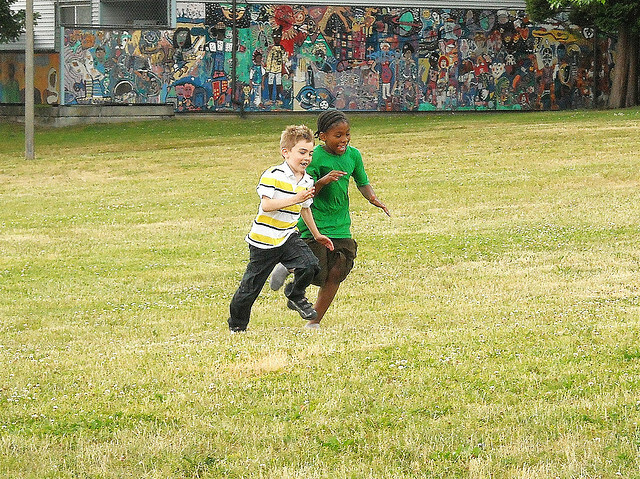 At the same time, many schools have reduced physical education requirements and scaled back recess time. Most parents believe physical activity is an important component of their children’s health, and a significant number worry that their children are not getting enough exercise. Read the full story on WDDE.org.